Former first lady Michelle Obama and moderator Michele Norris addressed the crowd at TD Garden Saturday night. 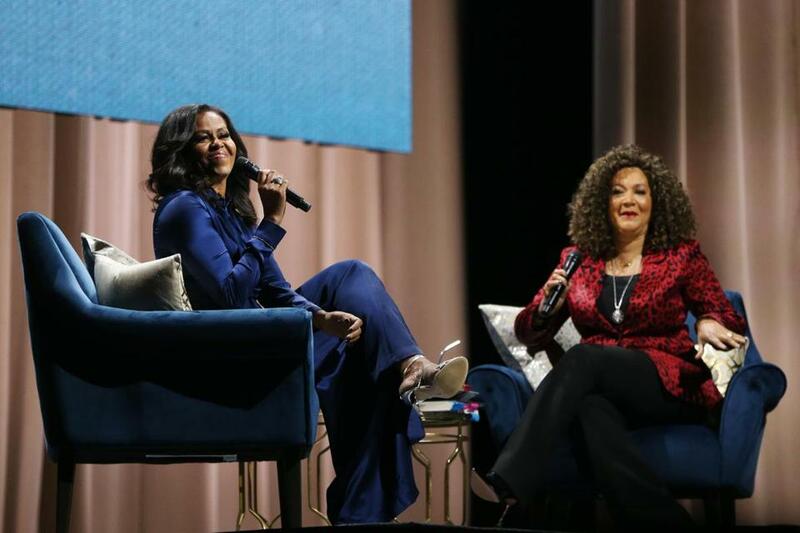 Former first lady Michelle Obama swept into Boston on Saturday, chatting with young women about their lives — and hers — at a Dorchester roundtable in the afternoon and discussing her memoir before a sold-out, thunderous, joyful TD Garden crowd in the evening. Obama, who came to Boston as part of her international book tour, kept the thousands of people in the audience rapt as she spoke about her upbringing in Chicago, being a lawyer, meeting Barack, life in the White House as the country’s first black first lady, and her aspirational message. She dispensed advice, was self-effacing, and in the conversation with former NPR host Michele Norris, she also had the Garden audience laughing, especially discussing her first impressions of the future president. 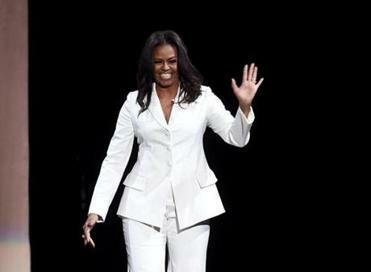 In Boston this weekend for her book tour, Michelle Obama is entering a superstar status reserved for the likes of Beyoncé. And some people can’t get over it. She recalled writing him off. Then they spoke on the phone and she “heard that voice, ‘Hello . . .’ ” she said, mimicking his baritone. Michelle pantomimed giving a shocked look at a telephone receiver. The audience roared. She also held the crowd spellbound, recalling her father, who, despite struggling with multiple sclerosis, never missed a day of work. “He brought to our lives everything we could ever possibly need: love, stability, grace, dignity,” she said. And she spoke about the transition from the Obama White House to the Trump White House, offering an indirect reference to the controversy over Trump’s inauguration crowd size. Obama left the thought unfinished. After about three seconds, the audience got the reference and broke into rapturous applause and laughter. Earlier, at the Berkshire Partners Blue Hill Boys & Girls Club in Dorchester Saturday afternoon, Obama listened as 20 women of color in their teens and 20s told their personal stories, asked for advice, and cheered “Becoming,” which, they said, deeply resonated with them. “We were reading your book as if you wrote these stories about us,” said Maya Lyght, a 19-year-old college student from Michigan. Obama talked about her own life trajectory, growing up in a working-class family on Chicago’s South Side, going to Princeton University and then Harvard Law School. She spoke about how she was a box checker and was surprised by unexpected twists. Obama encouraged the young women to embrace some of the swerves that life brings their way, even as they are checking their boxes. She encouraged them to find a balance. And while Obama struck several philosophical notes, some of her advice was anchored in more practical concerns for people in school. “This notion of pulling all-nighters is like — that’s bad planning as far as I’m concerned,” the former first lady said to knowing laughter from the table. The Boys & Girls Club event was among the smaller community appearances Obama has made alongside the arena-filling conversations in front of thousands. In Los Angeles, for example, she made a surprise visit and read to 4-year-olds at an early childhood education center. The book tour has, so far, coincided with massive sales. In its first week out, “Becoming” sold more than 1.4 million copies in print and digital formats in the United States and Canada, making the memoir a runaway hit. Its sales are well exceeding the pace of previous memoirs by first ladies. In 2003, Hillary Clinton’s “Living History” had first week sales of around 600,000 copies. Obama’s evening appearance at the Garden, where she wasgreeted like a rock star, is something of a bookend to her husband’s keynote speech during the 2004 Democratic National Convention, which turned him into a political celebrity and helped catapult the then-Illinois state senator toward the presidency. In her memoir, Obama recalls the speech at the very same arena in Boston, then the Fleet Center. She remembers the roar of the crowd, applause booming to the rafters. She writes of walking on stage “into the blinding lights” to give her husband a congratulatory hug. And she describes the surreal shift after the speech, watching as his cellphone rang nonstop and people stopped him on the street to ask for his autograph. Fourteen years later, Saturday night, she was the main event. And the metaphorical hug come from the thousands of fans there just for her. The crowd replied with a sustained, deafening cheer as if to say: We did, and we’re glad about it. Material from the Associated Press was used in this report. Joshua Miller can be reached at joshua.miller@globe.com.